Well it may have been a very long 3 week wait since my submission, but I am thrilled to say that I have passed not one, but TWO qualification panels and received a Qualified status. This is an awesome achievement that I am so proud of. I have been working towards this for last few months, and I am so pleased to have passed. So what is a Qualified status? Our ‘Qualified’ status is aligned to standards of competence that reflect a level where the customer should be ‘pleased with the results’, when employing the services of a skilled tradesman (the photographer). 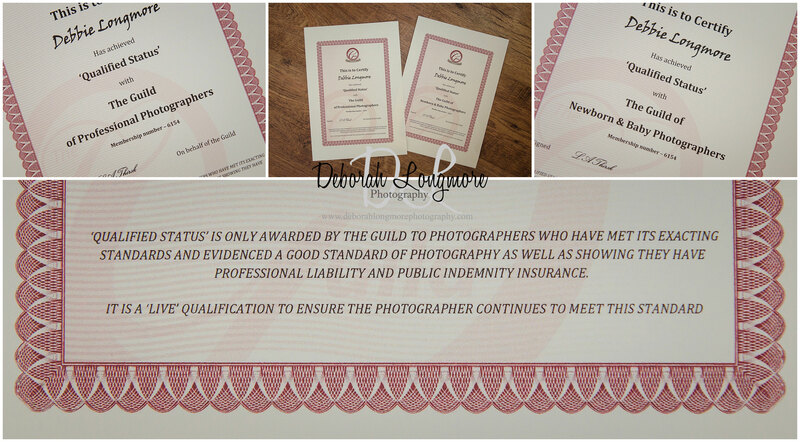 In other words ‘Qualified’ indicates professional ‘competence’ to a level where the Guild is willing to recognise the photographer as an ambassador of the association , so those who achieve that level should be proud of doing so. So which panels have I achieved a Qualified status in? This category required a selection of 3 images from each of 7 different customer commissions. ‘Newborns’ are defined as those up to 28 days of age, and ‘Babies’ are those which are either pre-walking or under 12 months of age (whichever comes first). This category required a selection of either 7 images from 3 different customer commissions or 3 images from 7 different customer commissions (none from ‘live’ weddings). Thank you to all my lovely clients who have visited me over the last year as without any of you this would not have been possible.